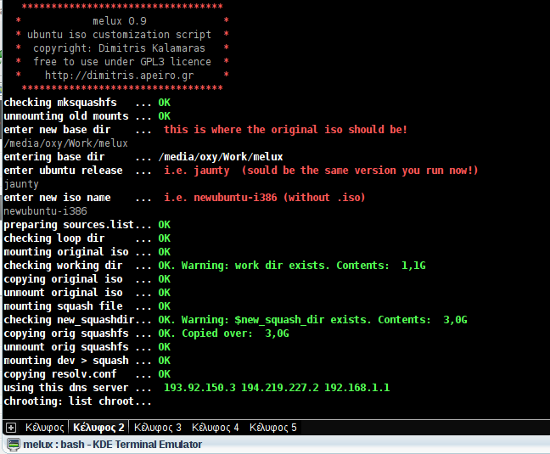 Melux is a Bash script which automates the creation of custom Ubuntu ISO images. It does nearly everything you would ever need to do: creates necessary working directories, mount-loops the original ubuntu iso, copies its contents, mount-loops the squashfs file, copies its contents in a new dir and chroots in it where it modifies sources.lists and resolv.conf so that the chroot system is usable, and then presents a nice menu for the user to select which package groups to add. By default, these are my favorite packages for math, multimedia and development, but you can easily modify lines 24-39 to specify your packages. Finally, melux creates the new squashfs file, updates all manifest files, and then creates your new custom Ubuntu iso. All these in under 400 lines of code, with full-blown ANSI colors (just for all times sake! ), with minimal user interaction. The only three things the user (that’s you!) needs to specify are: the base work dir (where you must have copied the original Ubuntu iso), the ubuntu release (which must be the same release you run on, of course), and the custom iso filename. Update: Of course, your running Ubuntu system should be connected to the Internet or else melux won’t be able to download and install the extra packages to your custom Ubuntu Live CD/DVD system. Note also that melux by default adds complete Greek language support and removes other languages. You can disable that by commenting out line 308.
melux custom ubuntu iso creation script in action! squash='./work/casper/filesystem.squashfs';  # DON'T CHANGE THIS! #	flashplugin-nonfree; it cannot be redistributed. # THAT'S ALL. JUST RELAX WHILE WE ARE MAKING YOUR CUSTOM UBUNTU ISO!!! sudo mkisofs -r -v -V "UbuntuNew" -cache-inodes -J -l  -b isolinux/isolinux.bin -c isolinux/boot.cat -no-emul-boot -boot-load-size 4 -boot-info-table -publisher "Dimitris Kalamaras" -p "[email protected]"  -o ../$newubuntu.iso . SocNetV version 0.60 says hi! hmm… I wish there was a Sidux port of that baby! So, Im going to ask before I do this.. This script will take an ISO, update it and then repackage it? And.. if this is the case does it remove the old kernels and obsolete files before repackaging? Yes, melux will do exactly that. It won’t update the kernel, but it will add several packages – these are predefined by me, but you can easily change them…For instance, open melux.sh with a text editor and search for desktop_packages or multimedia_packages. You can add whatever packages you want just after the equal sign.. Oh, use the version from the git repository. can I use it to make custom image of ubuntu server ? What I can do if I want to install one package form the source ? To my knowledge, ubuntu server is a stripped down ubuntu-desktop with added some server packages. I haven’t tested it, but I presume melux will work ok with ubuntu server iso. As for the source package, you just have to add source repositories to sources.list. So, yes, it can be done, but you need to modify melux.sh by adding the extra source repo line in lines 116-118.